Brian and I have arrived at the Breaking Bad picnic a bit later than most people have. Actually, if it had not been for a hot Texas weekend, a completed “to-do” list and a Netflix account we might never have found it. We didn’t intend to watch more than an episode or two to find out what all the brouhaha was about, however, three episodes later we are in too deep to turn back. These poor characters: a high school chemistry teacher who is swept into the world of methamphetamine production, his clueless wife, a brother-in-law who is a DEA agent, and his partner, a twenty-something who can’t catch a break seem to all be caught up in the fate of one bad decision after another. Where will it end? I’m tempted to do a Google search for a spoiler, but everyone assures me that I’ll enjoy the ending so just hang in there! But in the mean time, I waver between “serves you right” and “give them a break” with each episode. The writers of this show have a lock on two main principles of life: 1) you make your choices and then your choices make you; and 2) discontent is a very dangerous animal. Moreover, if the motivation for our choices is discontent, life is going to be extremely difficult. We need to take a closer look at discontent in order to understand why it is so dangerous. First, we need to remind ourselves that discontent is not caused by our external circumstances. Discontent is a response to our circumstances. Whatever life brings, we have a choice, we can accept what God has allowed into our lives, trust God’s sovereignty over our circumstances, bow before his wisdom in allowing them, submit to his refining of our personalities through them, and thank him that he is maturing and strengthening our faith… or not. Contentment reveals a heart that trusts God no matter what our circumstances. There is no danger here. If only Walter White (our Breaking Bad chemist) had trusted God to provide for his family. But then, there would be no show. Discontent manifests as a bitter, blaming, disrespectful, insubordinate, entitled, rebellious and self-righteous attitude toward life, other people, and ultimately God. Hmmm, that sounds like most of the characters in Breaking Bad, and unfortunately, sometimes you and me. Discontent reveals a dangerous state of our hearts. How is discontent dangerous? We don’t do a very good job of shining brightly if we are grumbling darkly. Discontent reveals corruption in the soul. Where there is corruption, there is decay and things break down. A corrupt heart blames God (or others) for every little trouble in life, refuses to take responsibility for one’s actions, and assumes that God is at our disposal. This is corrupt thinking. Discontent is seen as rebellion by God. Complaining is the smoke on the embers of discontent; and discontent fuels rebellion. Rebellion is a blazing fire we would do well to douse before it consumes us. Rebellion will bring the wrath of God. A discontent heart cannot worship God. Discontent questions every attribute of God – especially his love, mercy, grace, justice, sovereignty, and wisdom. Because discontent questions God, it is impossible to worship him. Worship is telling God he is worthy. Discontent tells him he is not worthy. Discontent takes away our present comfort. When we dwell on the negatives in our lives, we can’t simultaneously dwell on our comforts. We see what we don’t have and forget what we do. We short-sell God’s mercy. Discontent undoes our prayers. Jesus taught us to pray for God’s will on earth as it is in heaven. He taught us to pray for our daily bread. If we are not content with God’s will in our lives, or if we believe the bread is not sufficient for today, we are erasing the prayers we’ve just prayed. Discontent robs us of time. We can spend vast amounts of time obsessing over our circumstances – in conversations, thoughts, planning and scheming to change things, or simply by moping; and that is time we will never get back. This is not to say we can’t bring our troubles to God, the Bible is full of prayers from hurting people. But it is not acceptable to refuse whatever God chooses, (in our best interest and in his unfathomable wisdom), as the answer to our prayers. Are you flirting with danger because you are discontent? Would the TV show of your life be a series of consequences from poor choices based on discontent, or a shining testimony of someone who contentedly trusts God’s sovereignty in every circumstance of life? 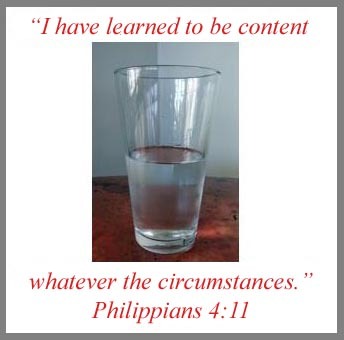 Discontent=The opposite of Joy the Lord provides. Thanks Marcia- you’ll never know how timely this is for me today! Bless you, friend- keep writing! Thank you, Nancy — all for the glory of God!